I love learning new words when I read, and the word ‘glaucous’ was something new I came across recently. It means a dull grey-ish green or blue colour. It’s amazing how many new words for colours I pick up when writing or critiquing other people’s novels. If you are describing something as being a particular colour, using the word repeatedly gets dull and forces the writer to find more descriptive terms. This is why a thesaurus is an invaluable resource for a writer. Blue can be azure, cerulean, teal, indigo, cobalt or navy. 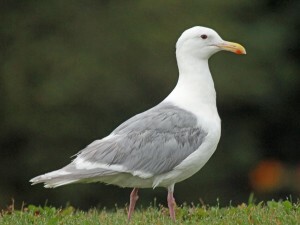 Or many other choices, including glaucous. So I had a look into the word glaucous to see how it originated. It turns out that the word, as well as being a colour, is also used to describe the powdery bloom that you get on grapes, and is also the name of a particular sea-bird: the glaucous gull. So named because of the greyish colour of it’s wings. The word glaucous has origins in both Greek and Latin, and was first used as a colour name in 1671. So I’m quite surprised I’ve never come across it before! I keep a list of new words on my phone, though I have to admit I rarely find the right spot to use them in my writing. Time to add glaucous to the list.